^ a b c #JapaneseCruisers1997pp.796-798, "Sendai Class, Summary Data Tables". 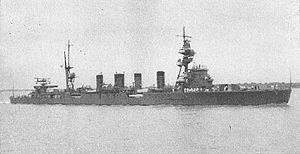 ^ a b #JapaneseCruisers1997pp.32,34, "Hull and Protection Particulars". p.34,Drawing 1.14, "Kuma Class, Midships Section". p.35, Drawing 1.15, "Jintsu, Midships Section". ^ #JapaneseCruisers1997p.798, "Machinery, Sendai Class, Summary Data Tables". ^ #JapaneseCruisers1997p.35, TABLE 1.10. "Variation in Deck Heights among the 5,500-Ton Cruisers"
^ a b #JapaneseCruisers1997p.34, Drawing 1.14. "Kuma Class, Midships Section"
^ a b #JapaneseCruisers1997p.34, Drawing 1.15. "Jintsu, Midships Section"
^ #JapaneseCruisers1997p.32, "Hull and Protection Particulaers"
^ #JapaneseCruisers1997p.33, Drawing1.13, "Sendai Class, Side View (as completed 1924)". ^ #JapaneseCruisers1997p.179, Drawing 5.13 "Sendai Class, Sede View of Bridge (as Completed 1925)". ^ a b c #JapaneseCruisersp.168, TABLE 5.4. ^ a b #JapaneseCruisers1997p.796, "Construction Yards and Dates". Eric Lacroix; Linton Wells II (1997). Japanese Cruisers of the Pacific War. Naval Institute Press.